Kaipo Hayashida of Kapolei kept the from ball from Mililani's Evan Kau during the OIA boys championship yesterday. Michael Smith was all the defense Mililani required. The goalkeeper was a force in the net and Dustin Shimatsu's goal 10 minutes into the game was all the offense the Trojans needed in an 1-0 win over Kapolei last night at the Kaiser High field. The victory gave Mililani (10-1-1) its fifth-straight Oahu Interscholastic Association boys soccer championship and ninth in the last 12 years. 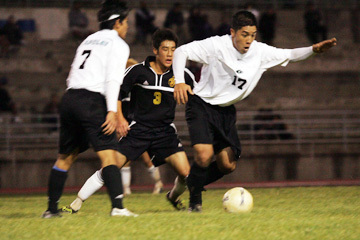 The win was sweet revenge for the Trojans, who lost to Kapolei 1-0 during the regular season. "He came out really big," Kapolei coach Bryce Kaneshiro said of Smith. "He's an incredible 'keeper and he showed it tonight. He made a lot of saves off of our set pieces." Kapolei (11-1-0) appeared to have what was needed to win its first OIA title in the second half, with the strong winds blowing with them. However, the Hurricanes could never convert against Smith and the Mililani defense. The Hurricanes had three corner kicks, including two in the final 10 minutes of the game. Smith poked away the last corner kick as it was sent directly toward the top left of the goal. One last attempt to score was stopped by the Mililani defense as several players fell to the ground in the scramble and the game was called right after. "Whoever had the wind behind was definitely at an advantage," Mililani coach Jeff Yamamoto said. "Kapolei is a fantastic team. We knew if they had the wind, they would be coming at us, they would be taking shots and they're going to be creating opportunities. Our goal was to try and cover everything. Cover all the shots and cover all their serves. Our goalkeeper really did a good job." When Kapolei found a look at the goal, Smith was there to stop it. The wide receiver on the Trojans football team who took up soccer in high school, jumped up for several catches on balls that appeared to be going into the net. "I was just waiting for the game to be over," Smith said. "We just didn't get the ball in," Kaneshiro said. "The wind was to our advantage, it worked well for us. We put the pressure on and we just didn't get it in." Mililani scored when Shimatsu tried to cross a pass that had too much spin on it, a pass that ended up in the goal. He didn't know he scored until he heard it hit the post. "We were just more determined to beat them because they beat us in the past," Shimatsu said. "There's that grudge between us."